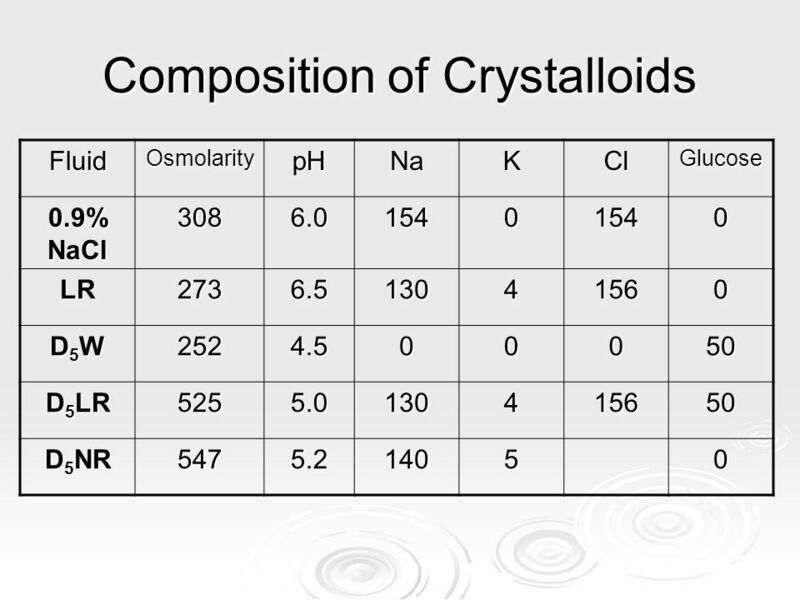 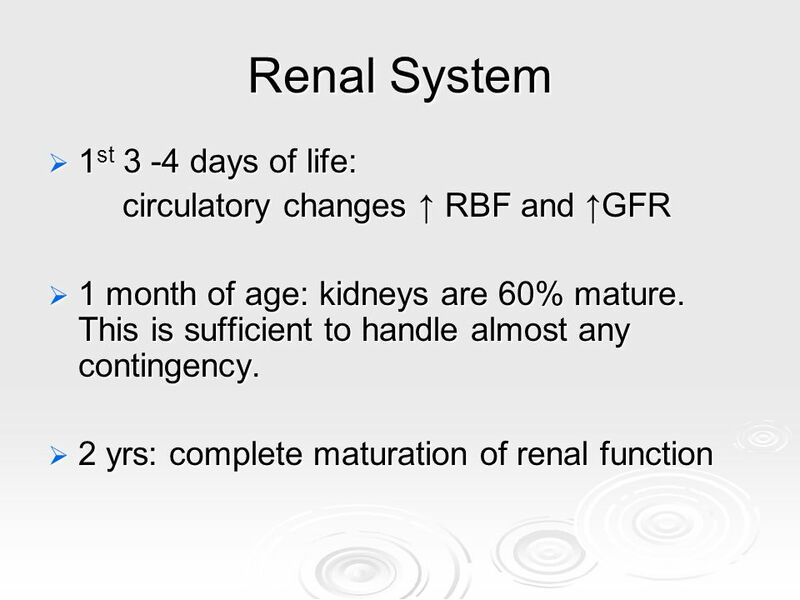 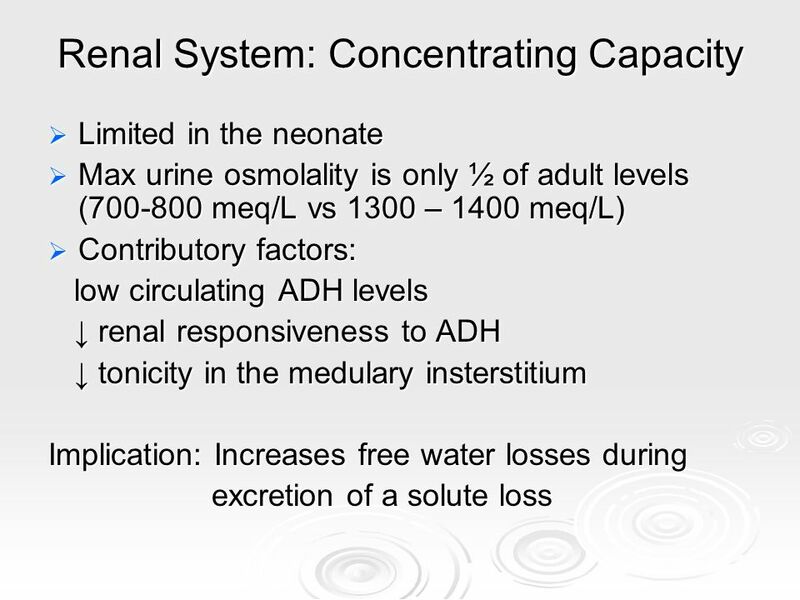 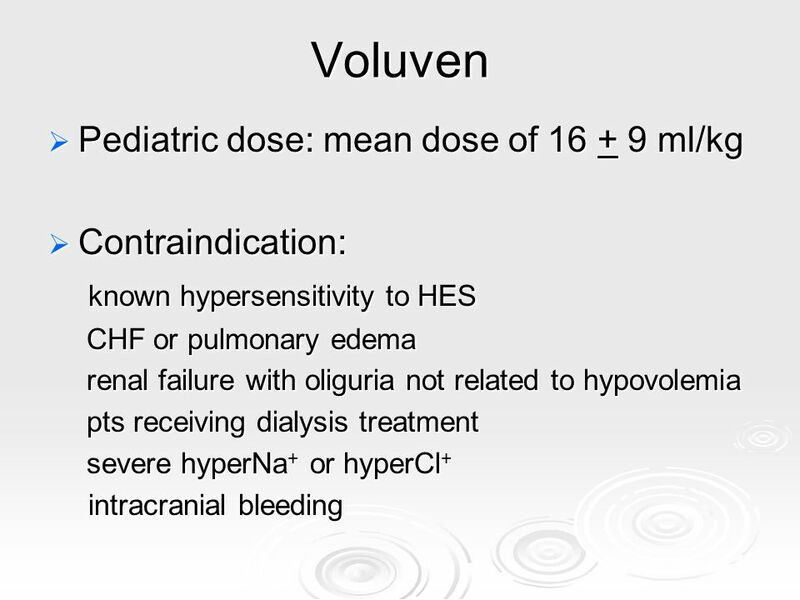 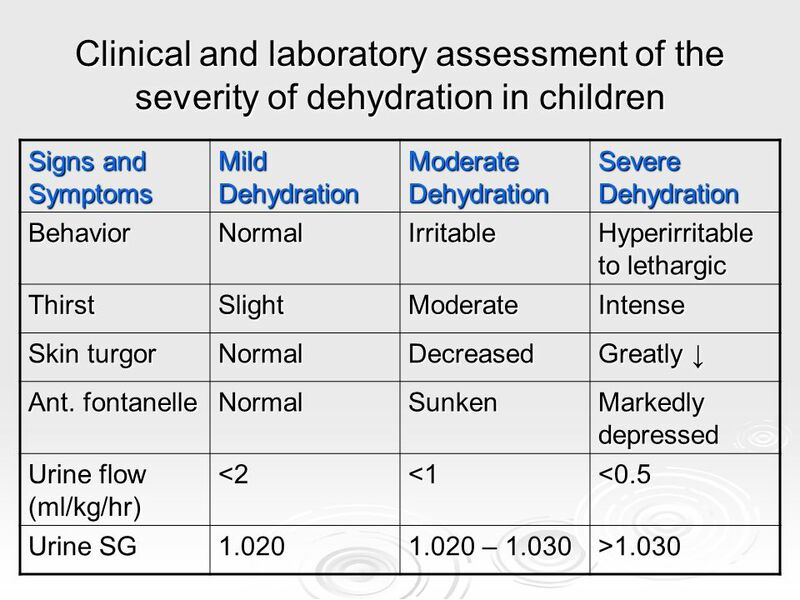 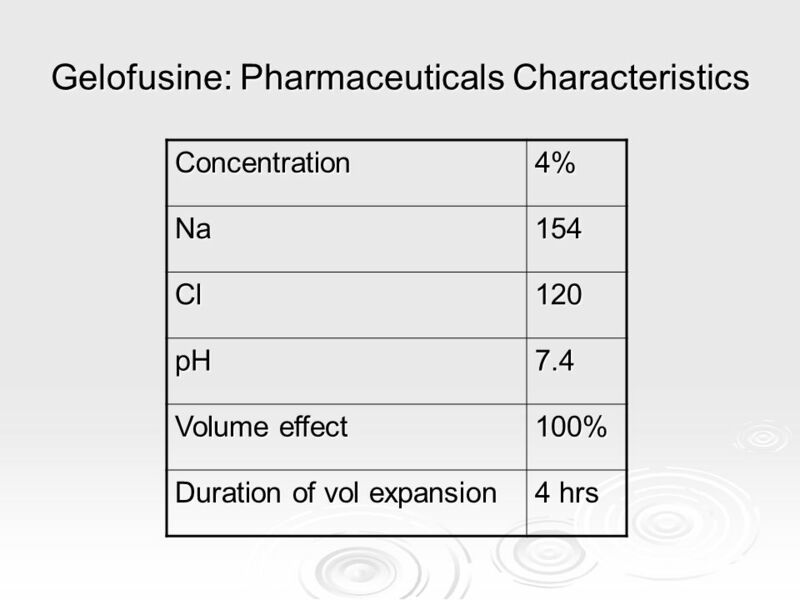 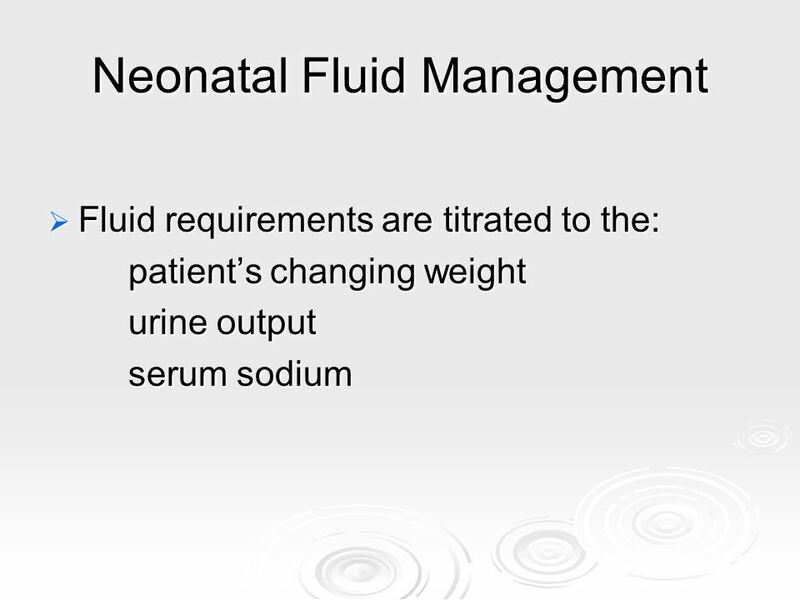 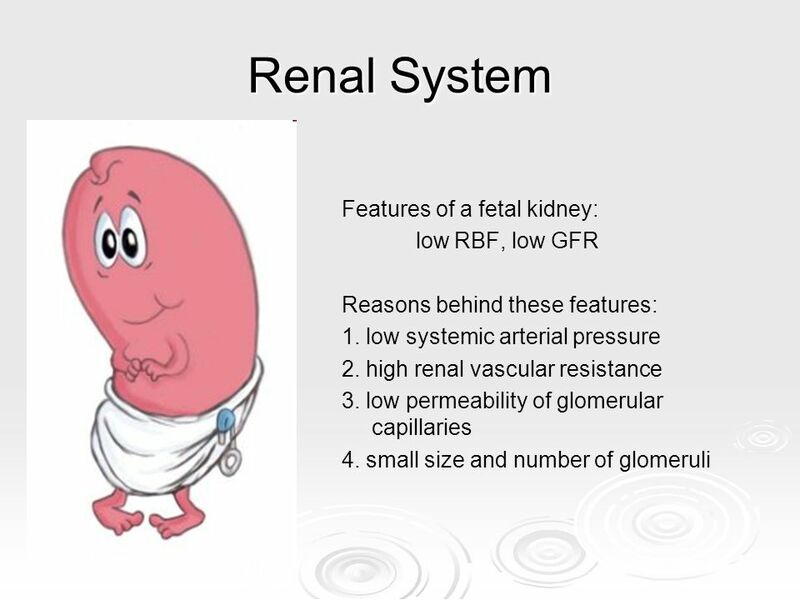 A water-loaded infant can excrete dilute urine with osmolality as low as 50 mOsm/kg. 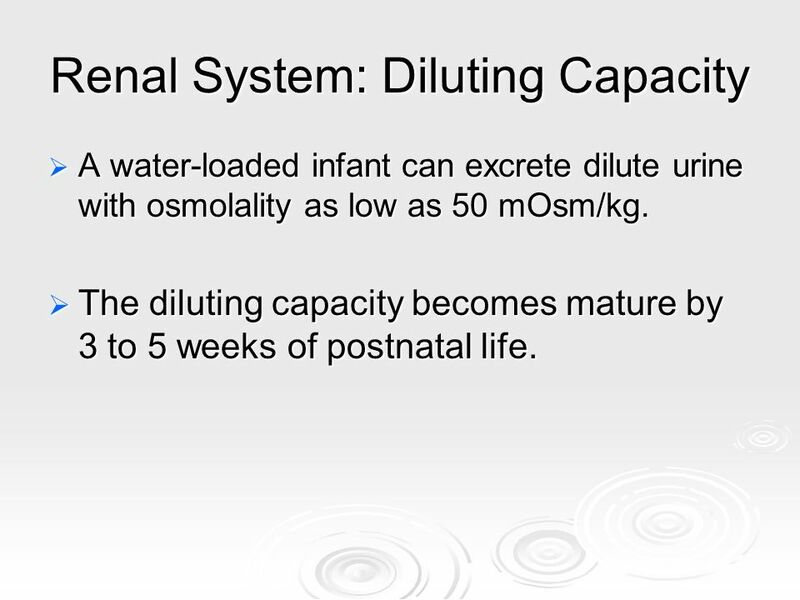 The diluting capacity becomes mature by 3 to 5 weeks of postnatal life. 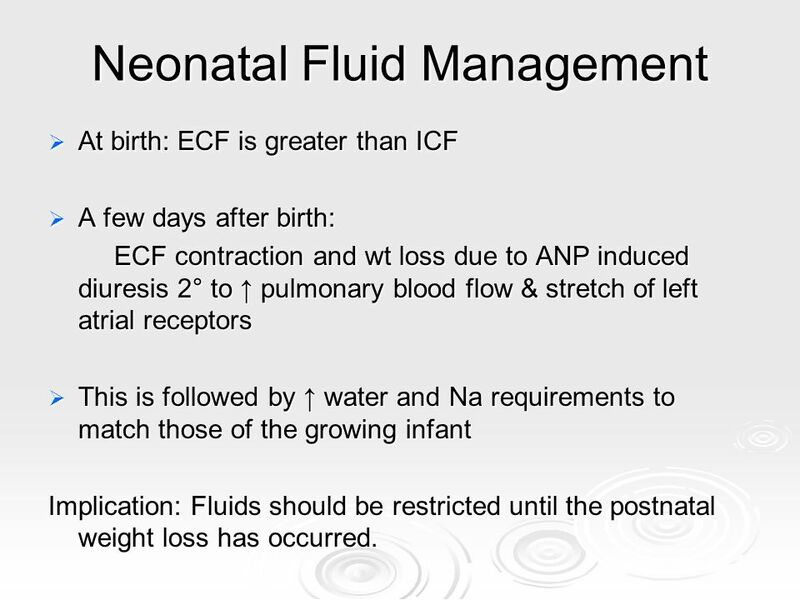 At birth: ECF is greater than ICF A few days after birth: ECF contraction and wt loss due to ANP induced diuresis 2° to ↑ pulmonary blood flow & stretch of left atrial receptors This is followed by ↑ water and Na requirements to match those of the growing infant Implication: Fluids should be restricted until the postnatal weight loss has occurred. 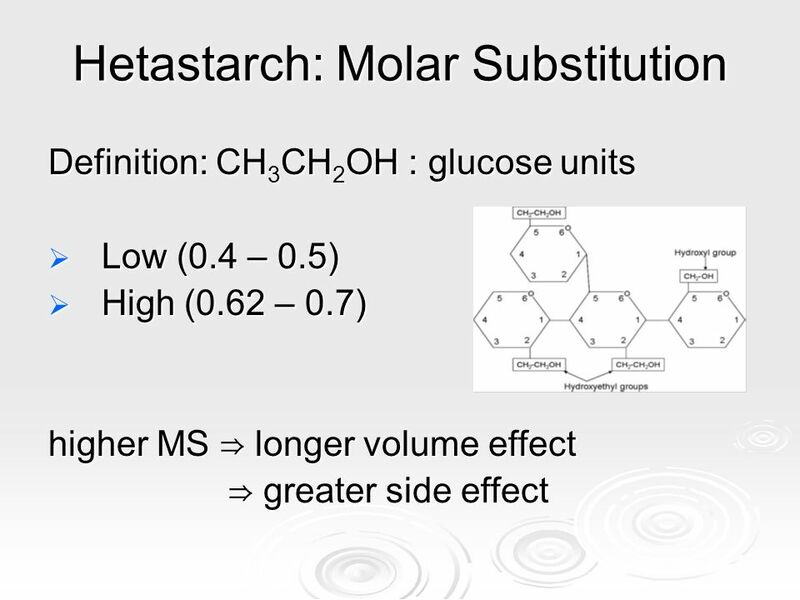 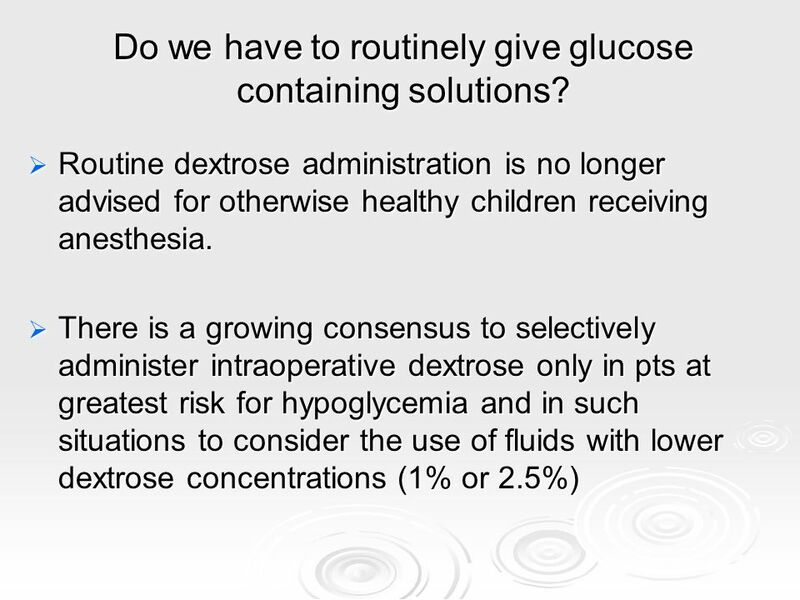 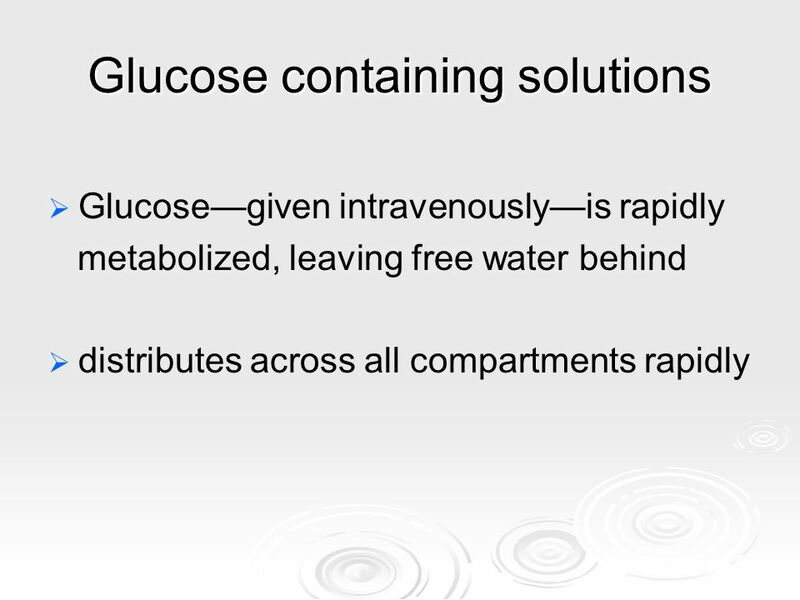 32 Do we have to routinely give glucose containing solutions? 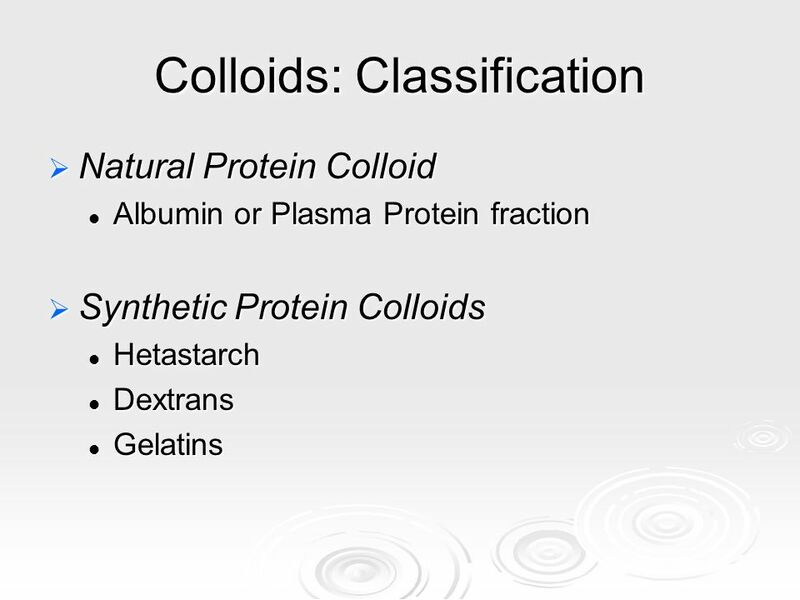 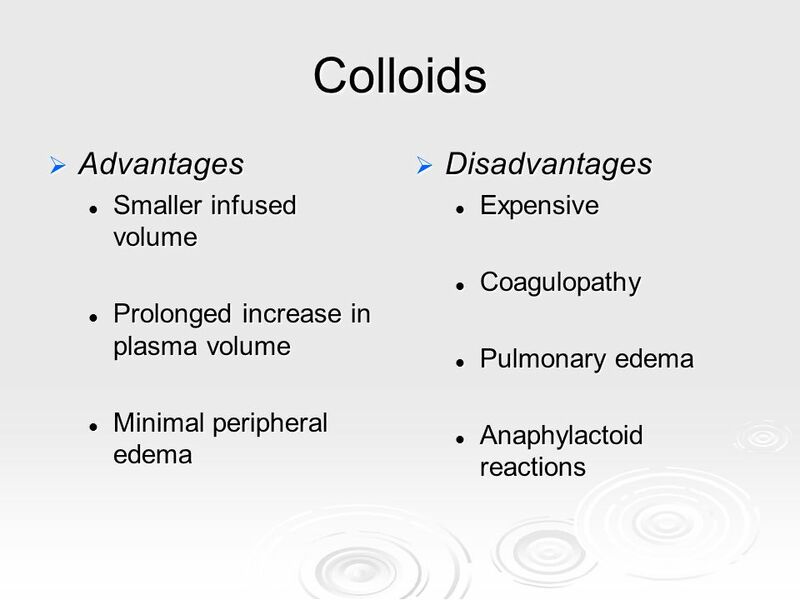 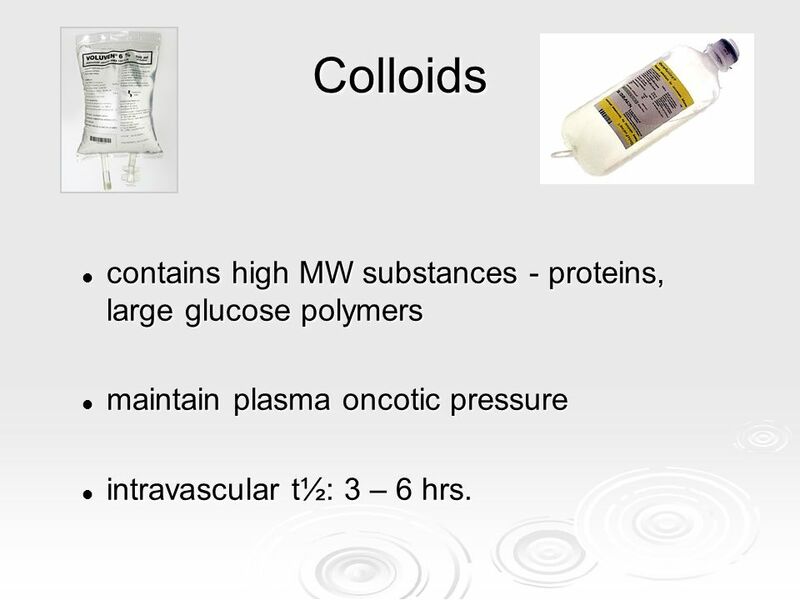 33 Colloids contains high MW substances - proteins, large glucose polymers maintain plasma oncotic pressure intravascular t½: 3 – 6 hrs. 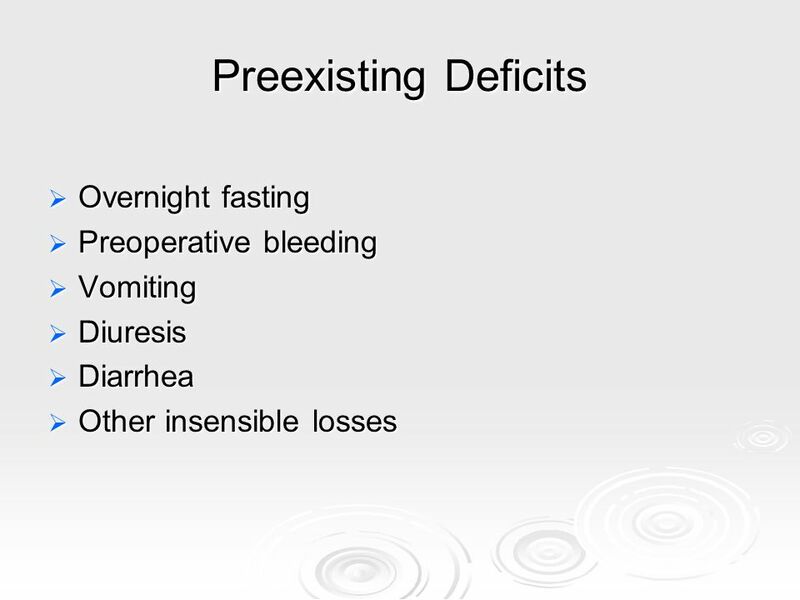 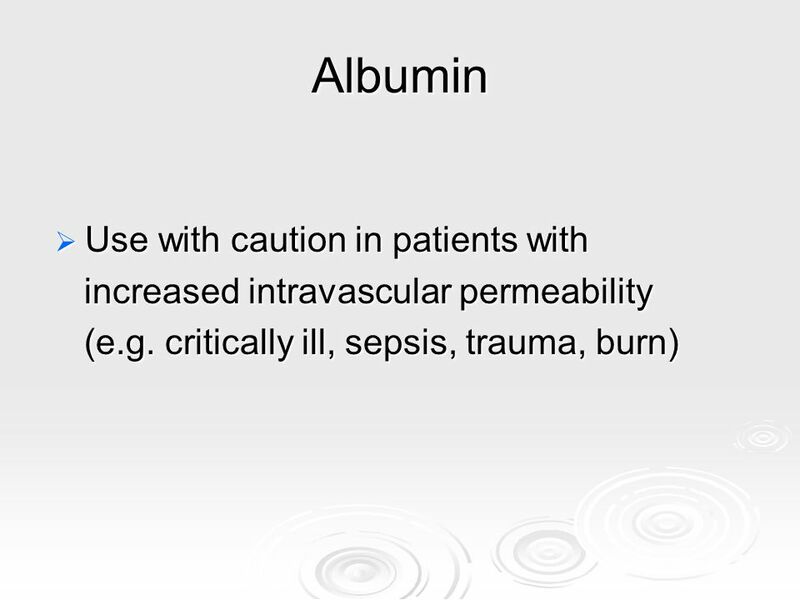 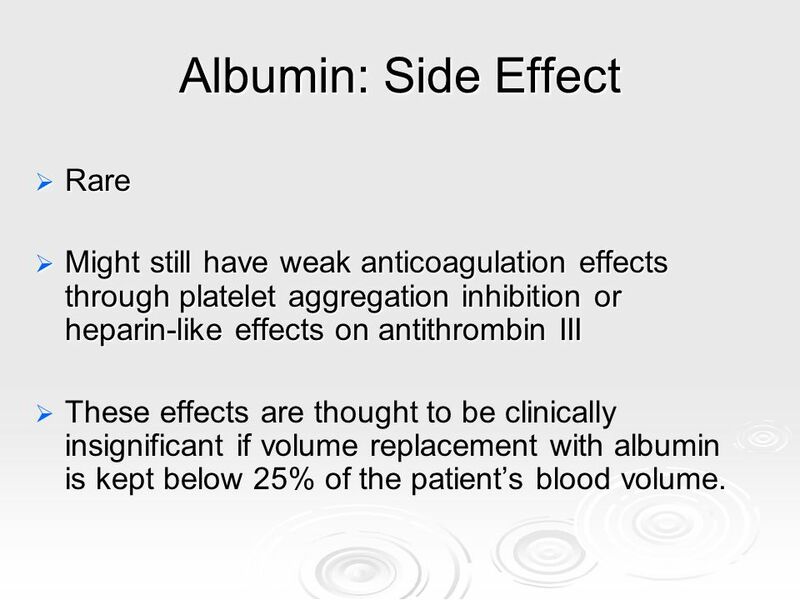 Might still have weak anticoagulation effects through platelet aggregation inhibition or heparin-like effects on antithrombin III These effects are thought to be clinically insignificant if volume replacement with albumin is kept below 25% of the patient’s blood volume. 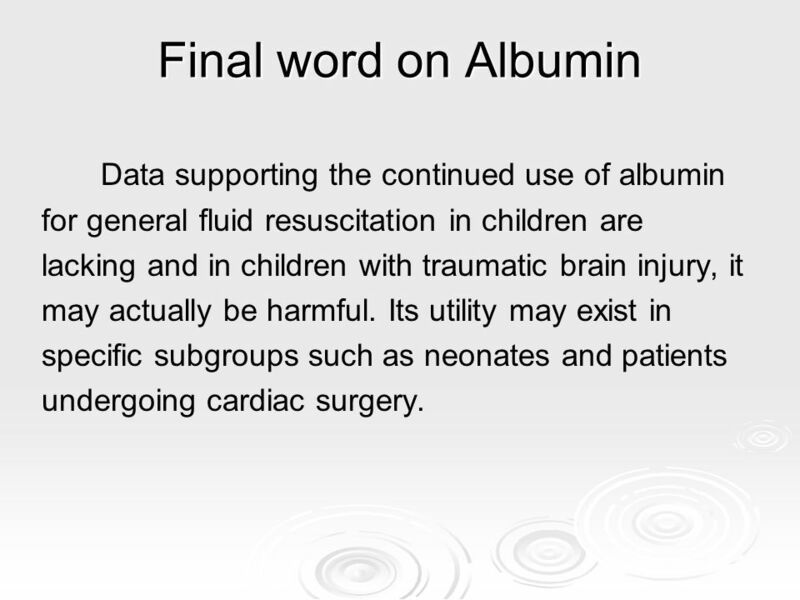 for general fluid resuscitation in children are lacking and in children with traumatic brain injury, it may actually be harmful. 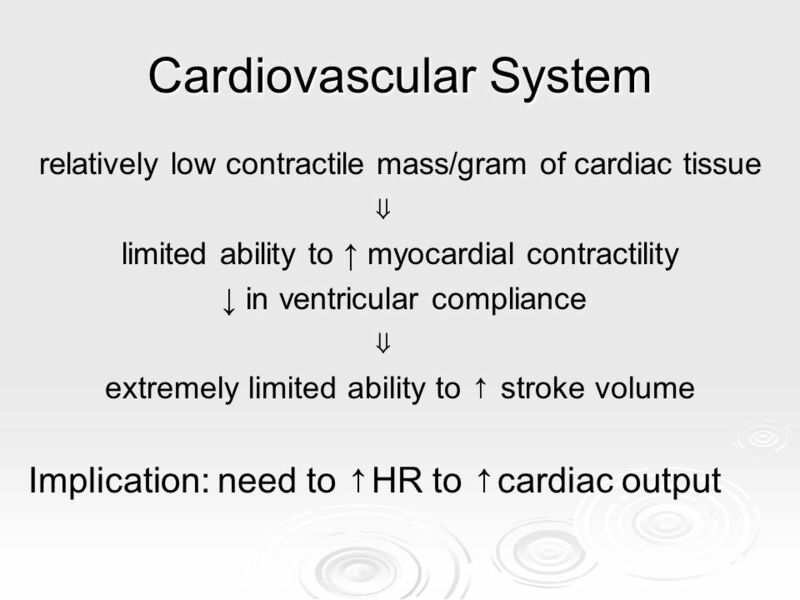 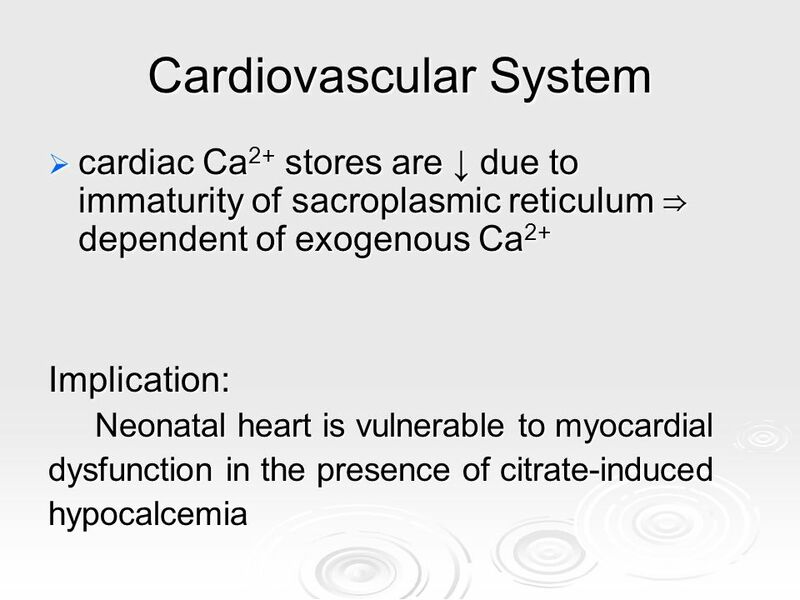 Its utility may exist in specific subgroups such as neonates and patients undergoing cardiac surgery. 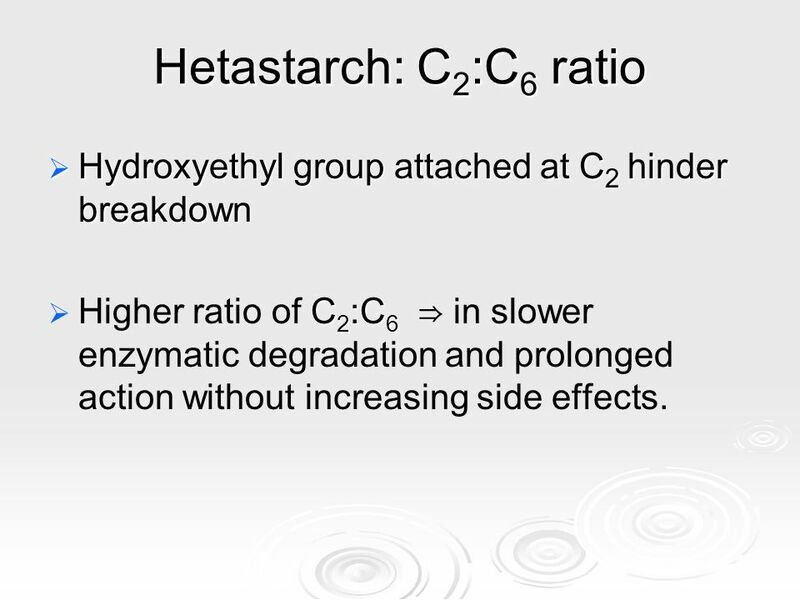 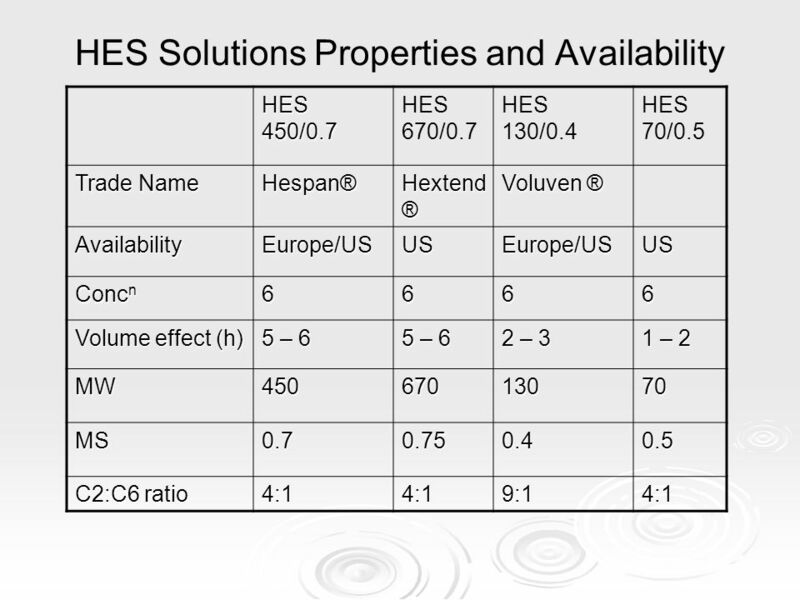 44 Hetastarch: C2:C6 ratio Hydroxyethyl group attached at C2 hinder breakdown Higher ratio of C2:C6 ⇒ in slower enzymatic degradation and prolonged action without increasing side effects. 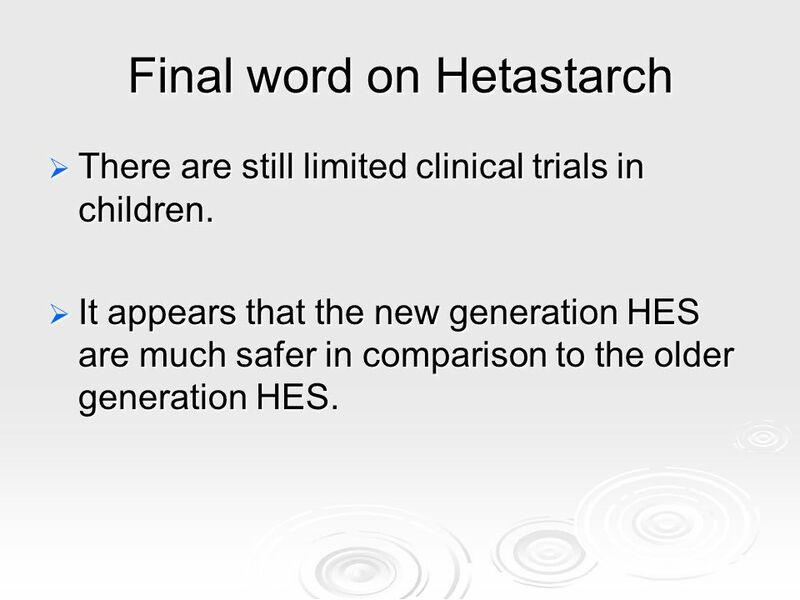 There are still limited clinical trials in children. 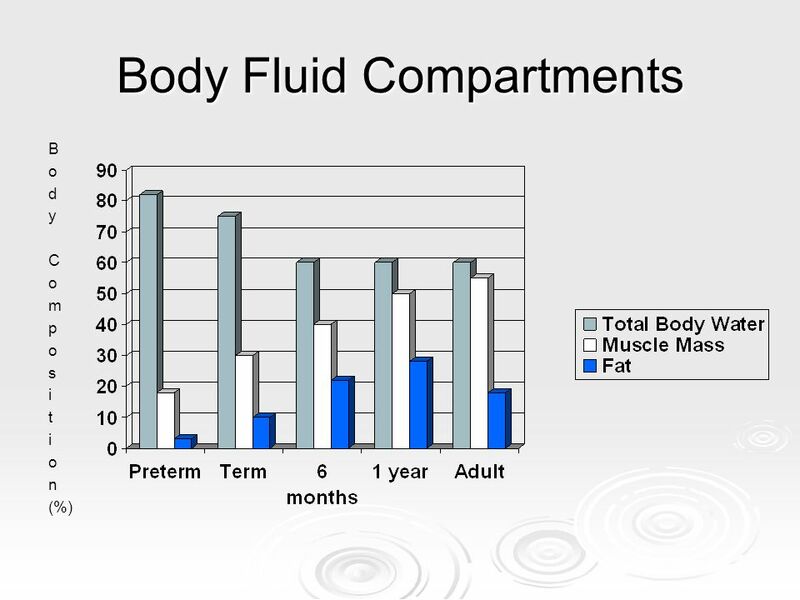 It appears that the new generation HES are much safer in comparison to the older generation HES. 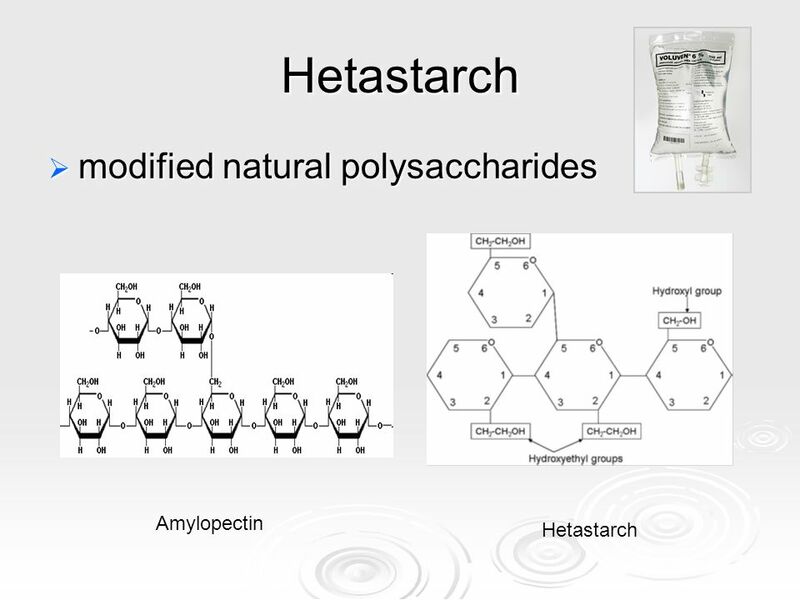 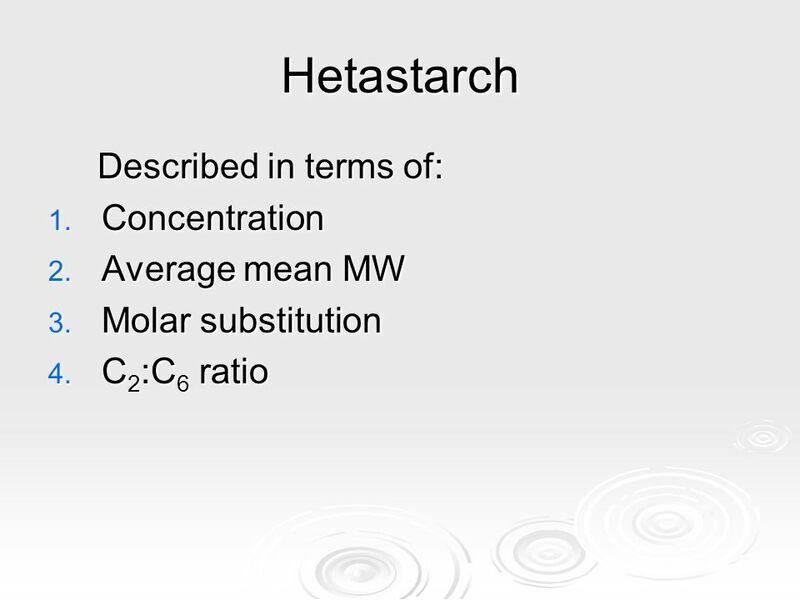 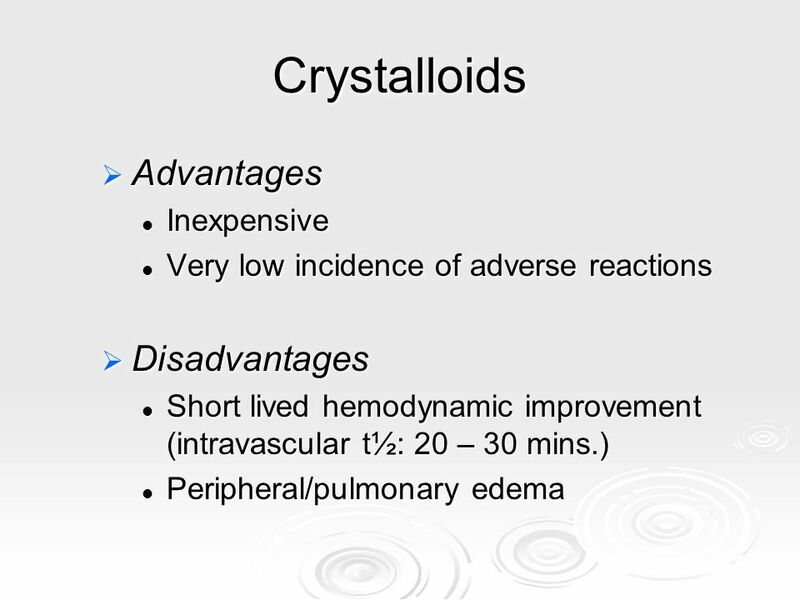 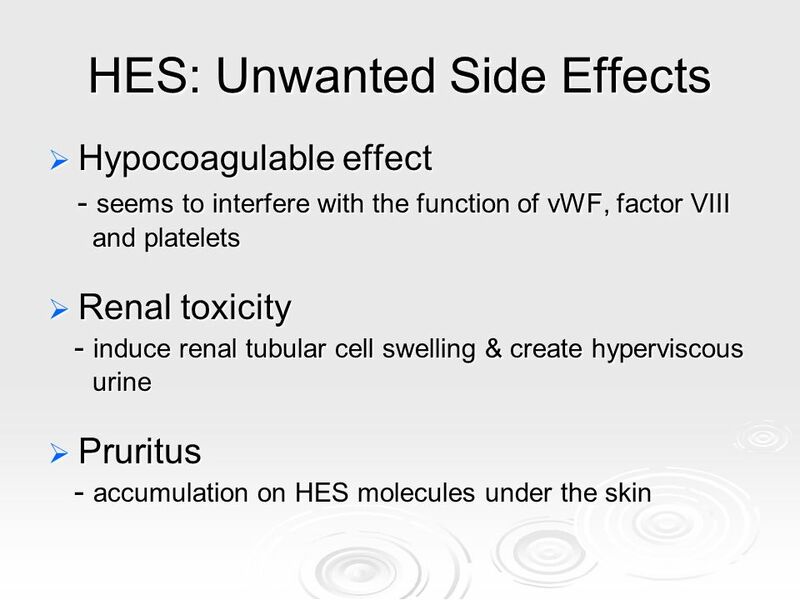 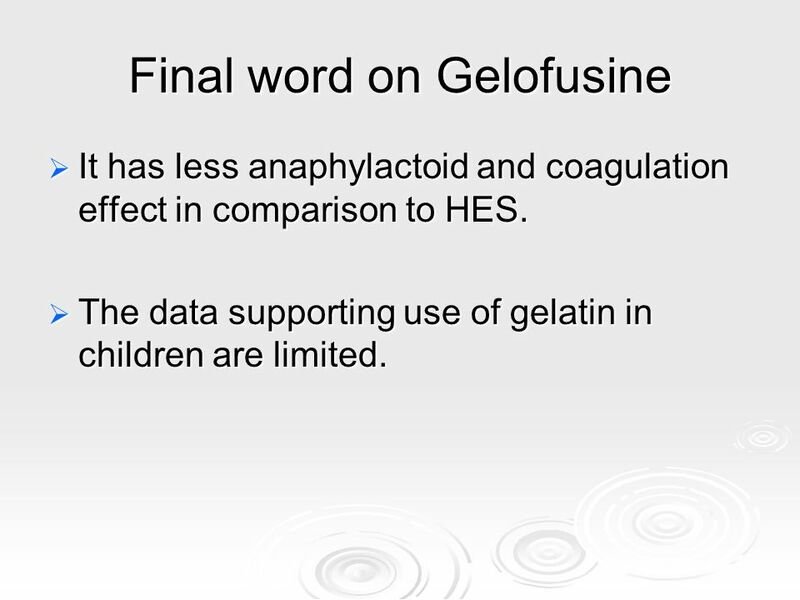 It has less anaphylactoid and coagulation effect in comparison to HES. 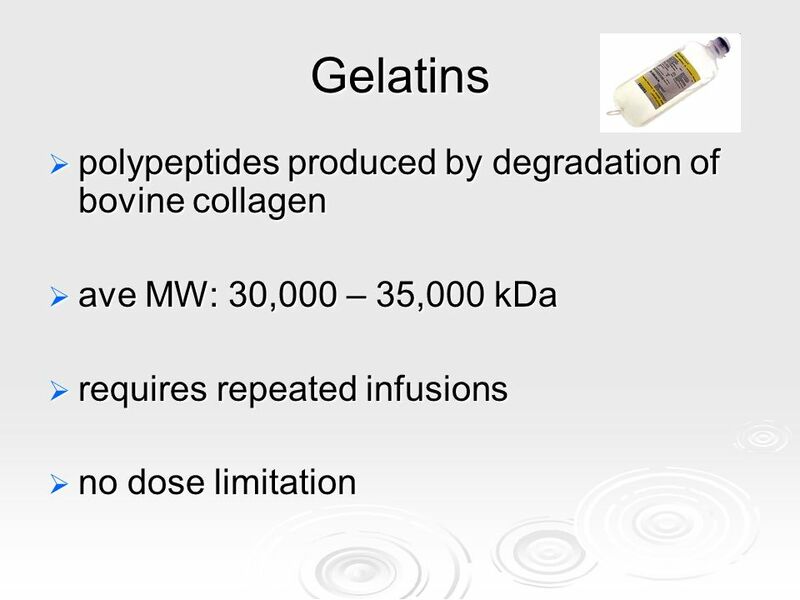 The data supporting use of gelatin in children are limited. 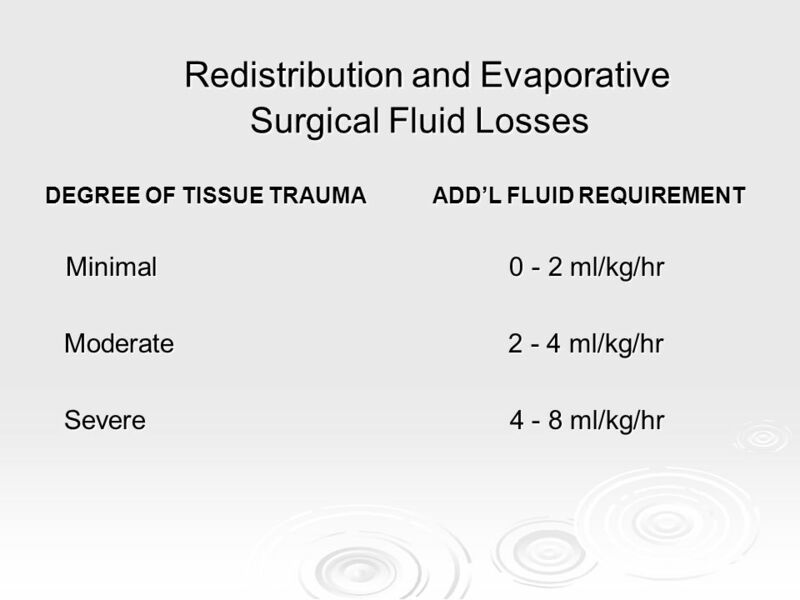 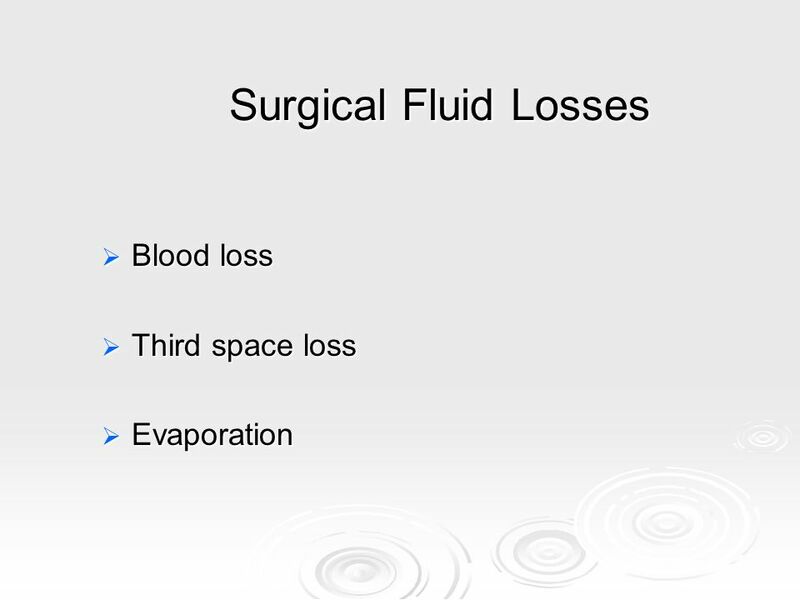 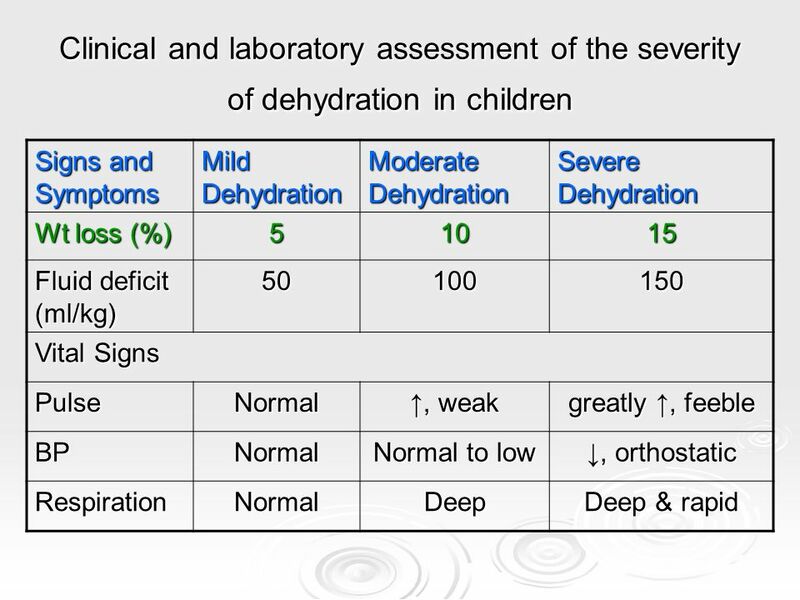 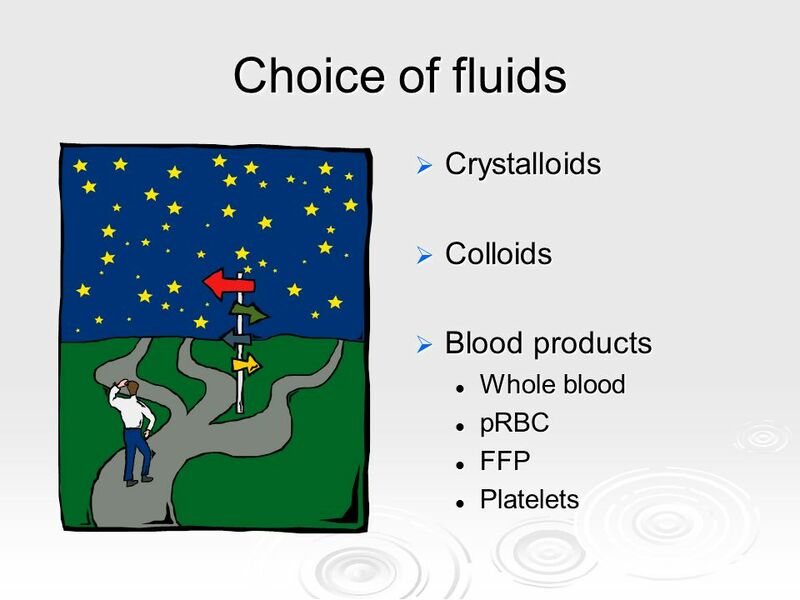 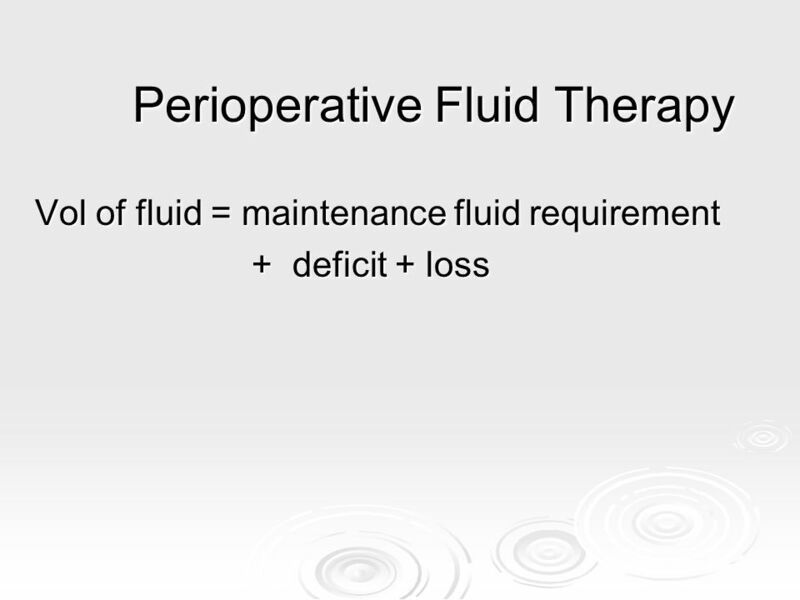 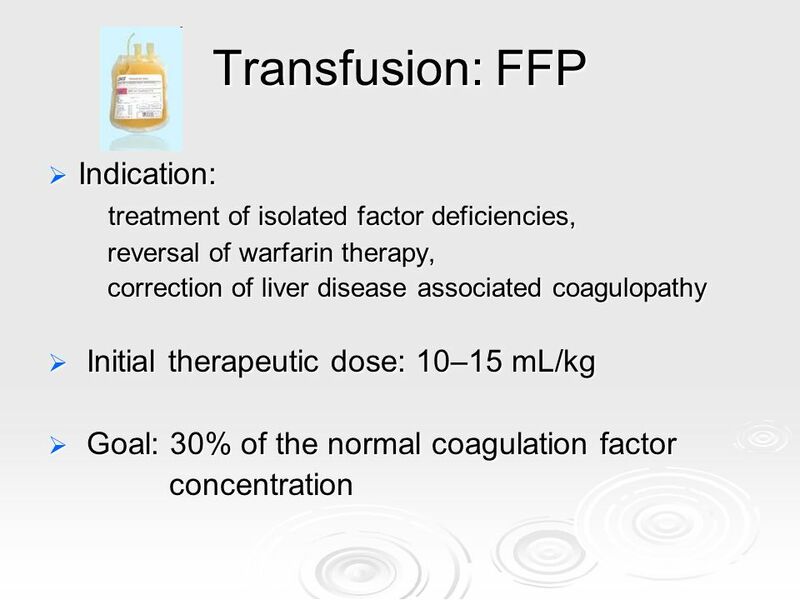 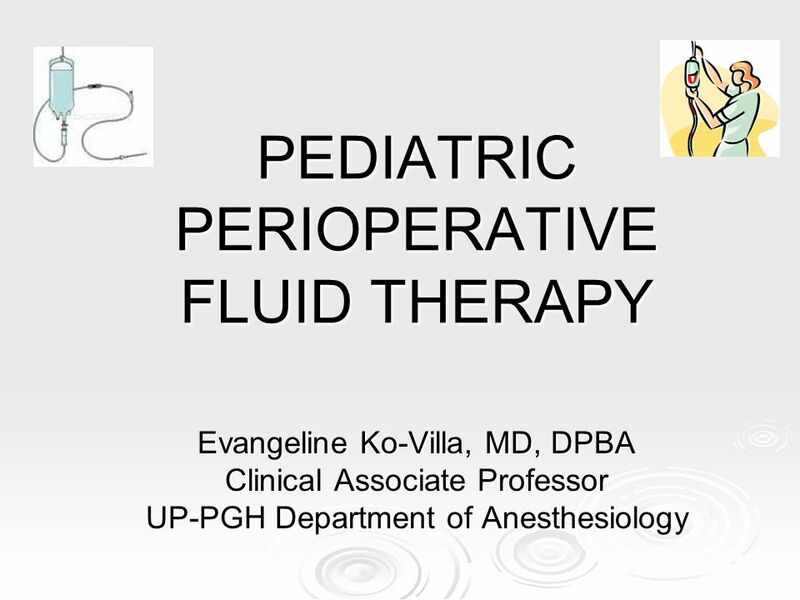 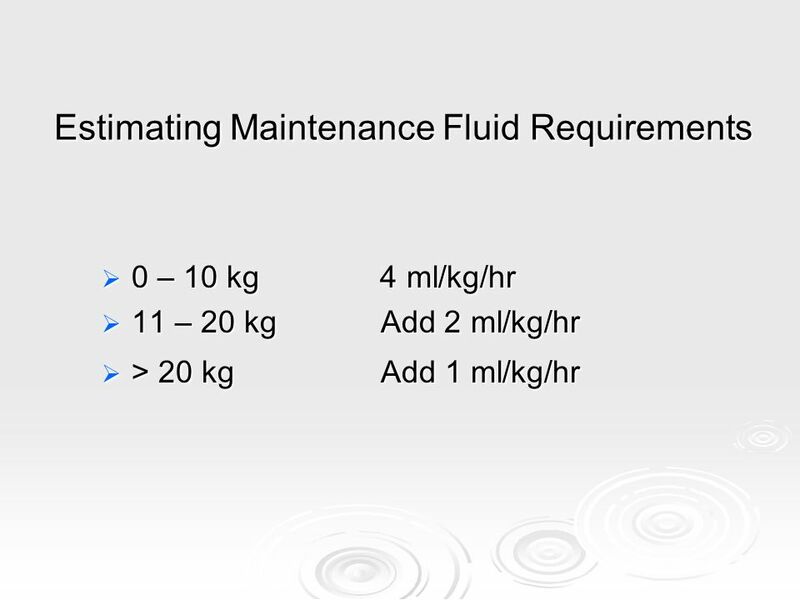 Download ppt "PEDIATRIC PERIOPERATIVE FLUID THERAPY"
from Total body fluids = 600ml/kg in men(60%) and 500ml/kg in women (50%). 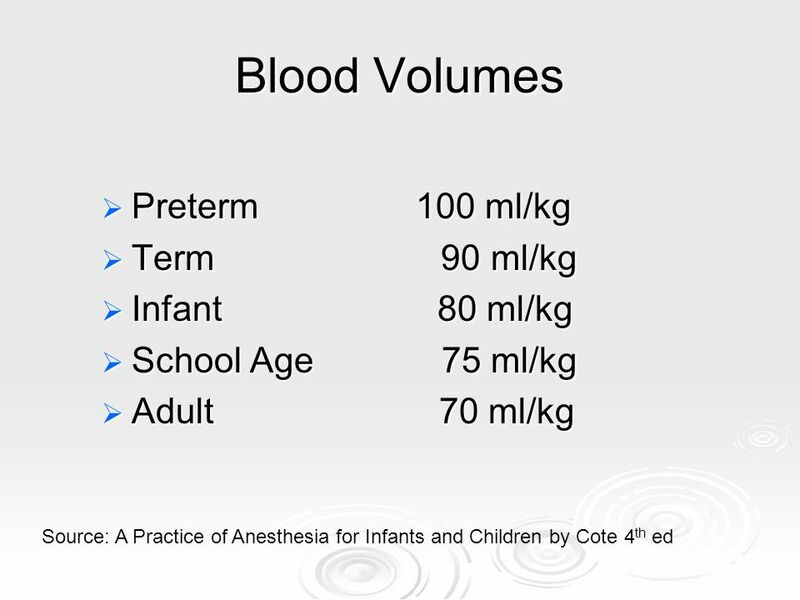 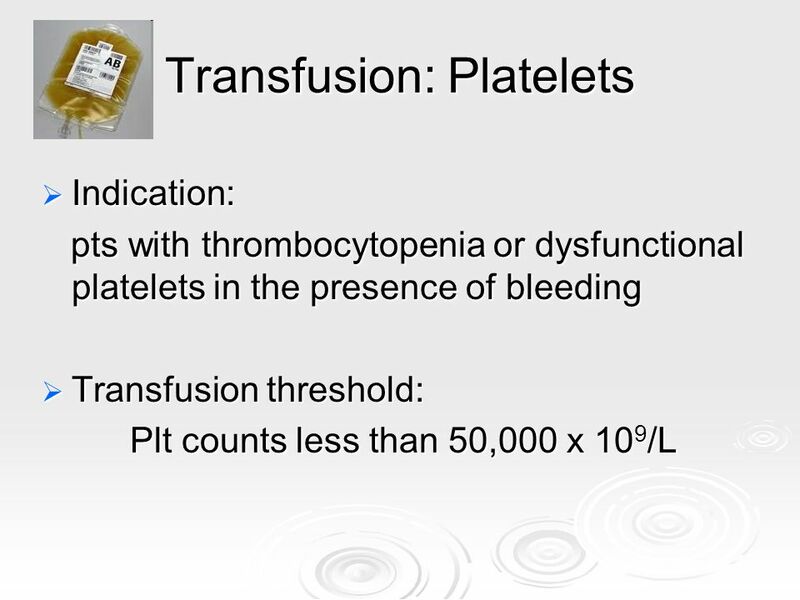 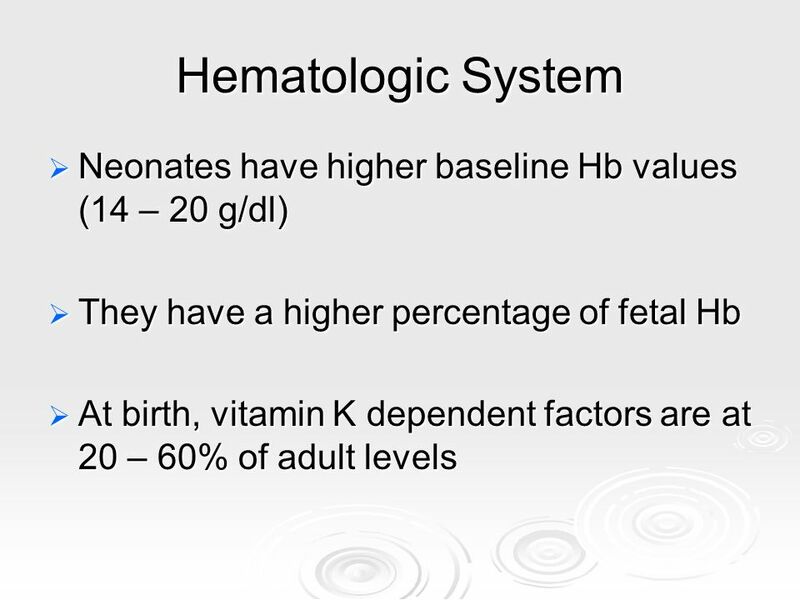 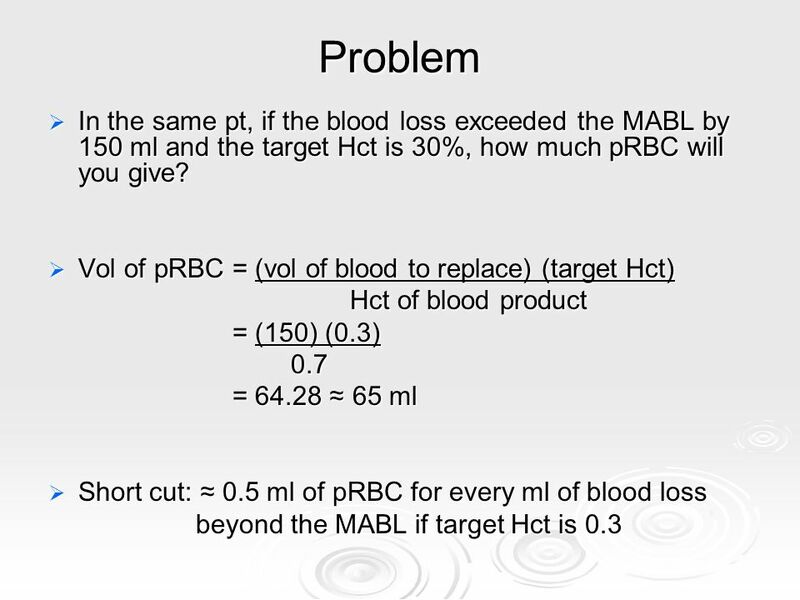 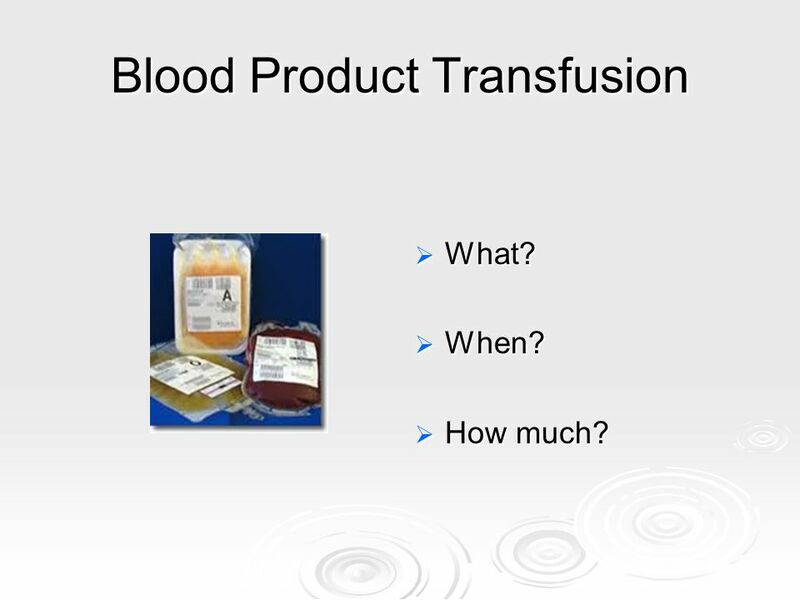 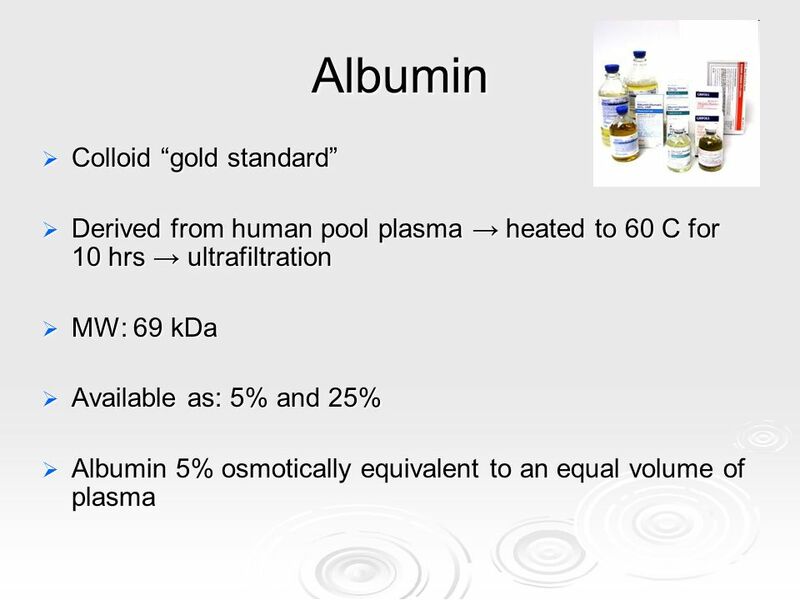 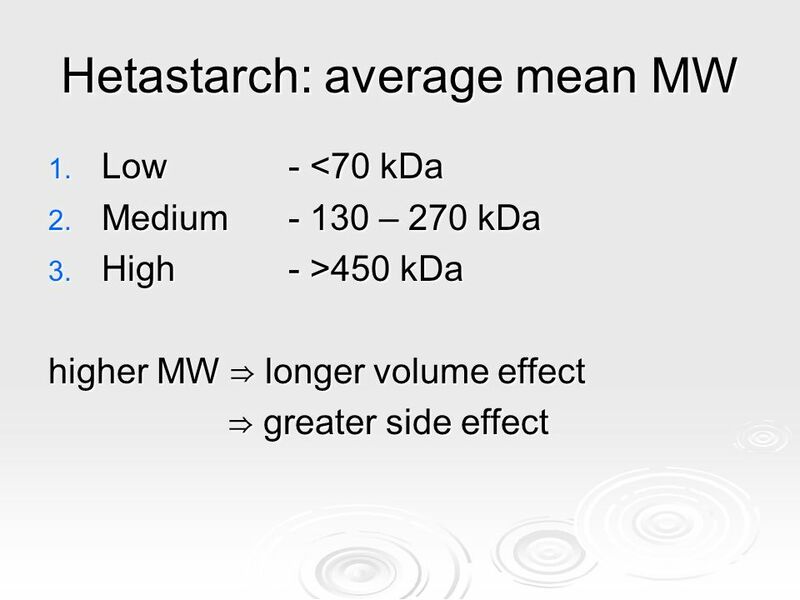 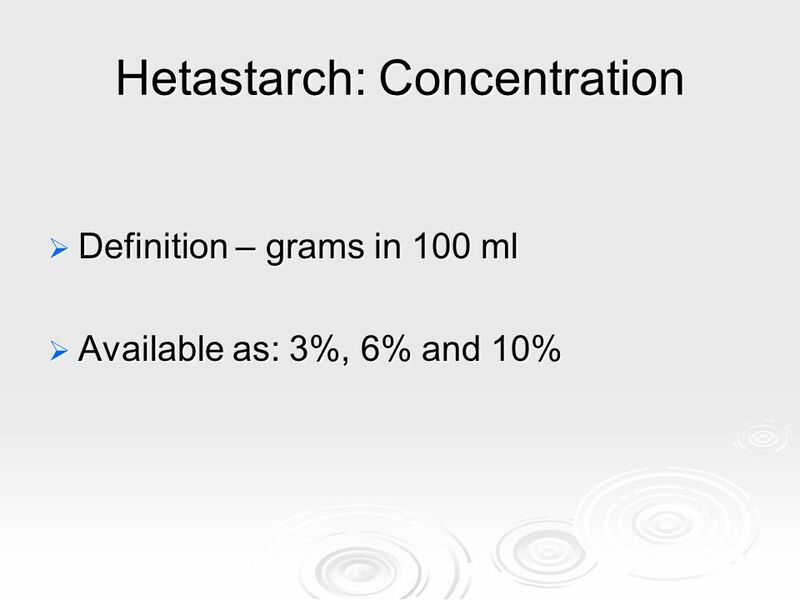 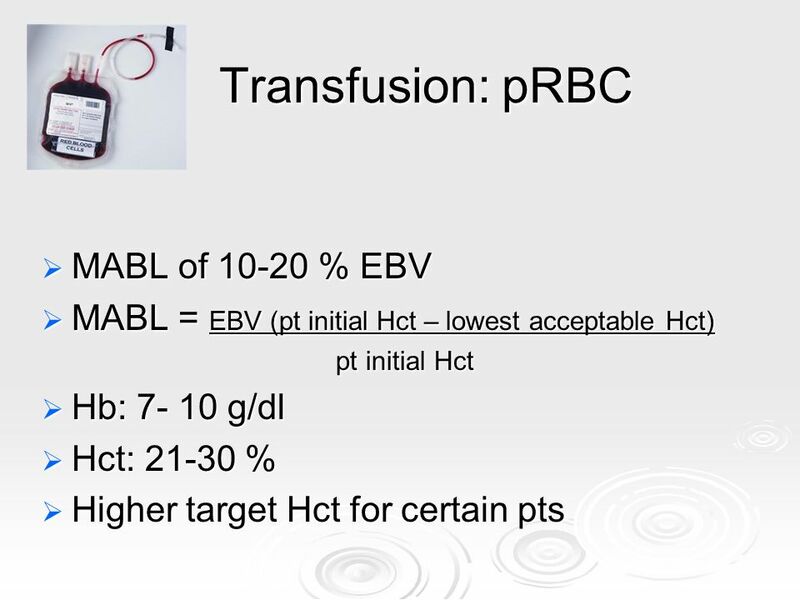 Whole blood = 66ml/kg in men and 60ml/kg in women Plasma= 40ml/kg in men. 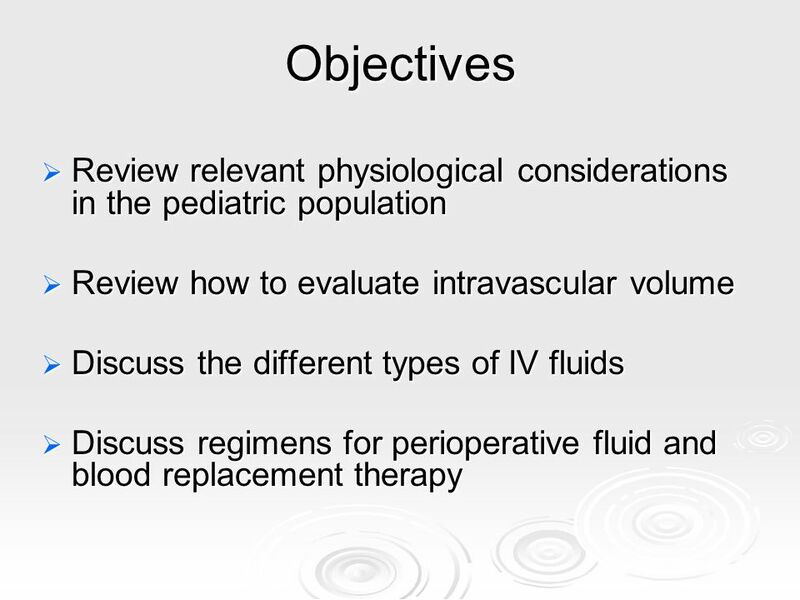 IV Fluid Management DFM Fellows Summer 2010. 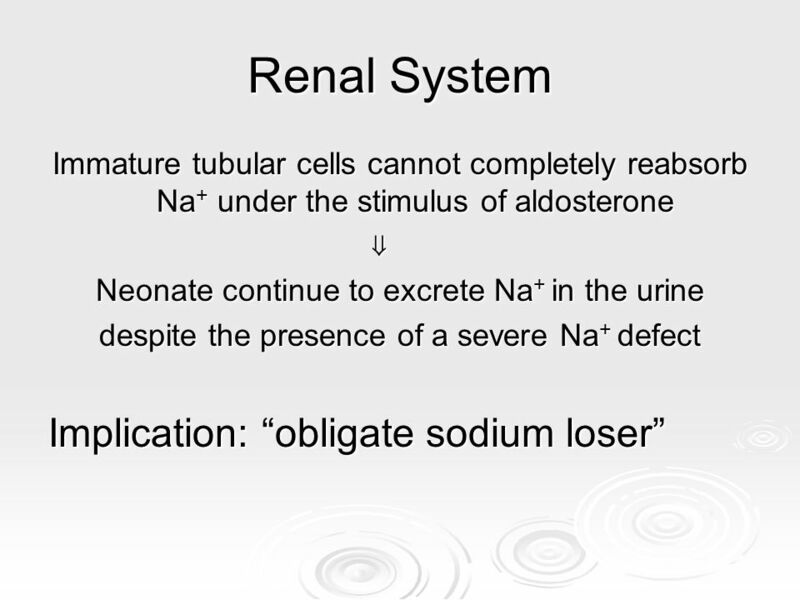 SODIUM HOMEOSTASIS Mohammed Almeziny BsPharm R,Ph. 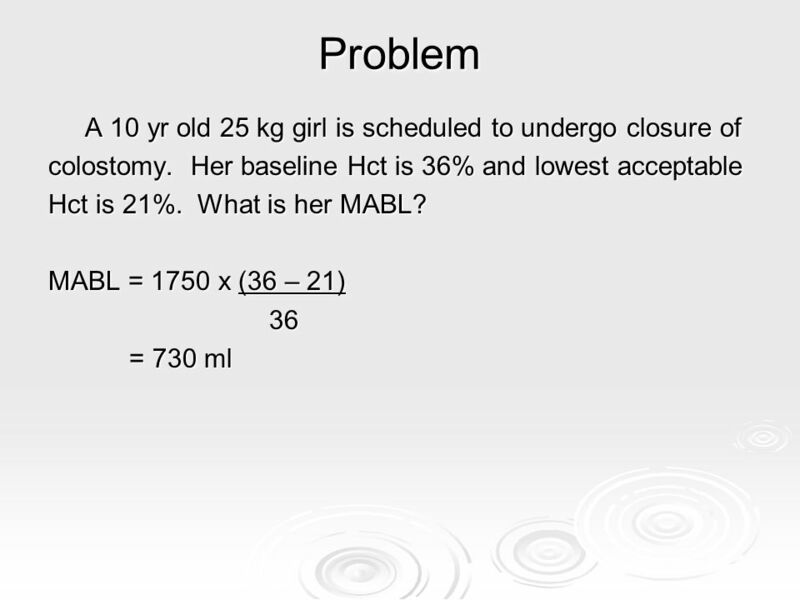 Msc PhD Clinical Pharmacist. 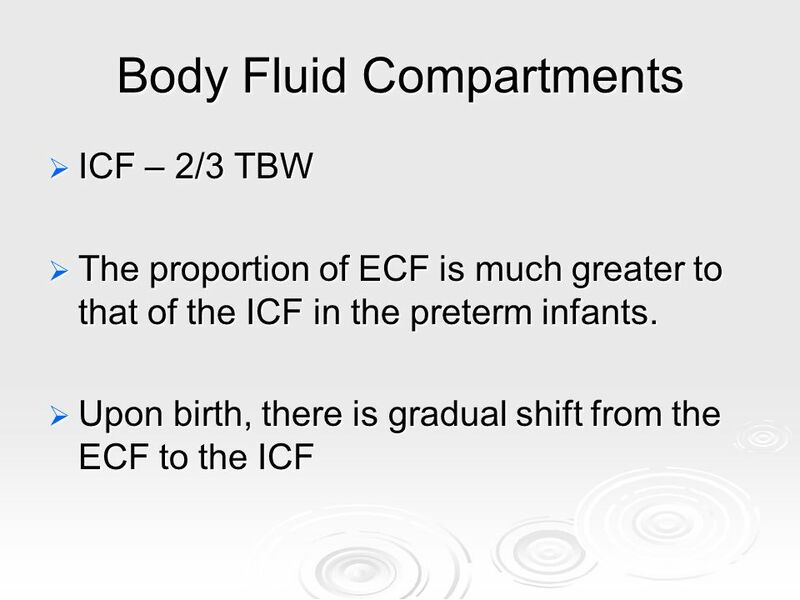 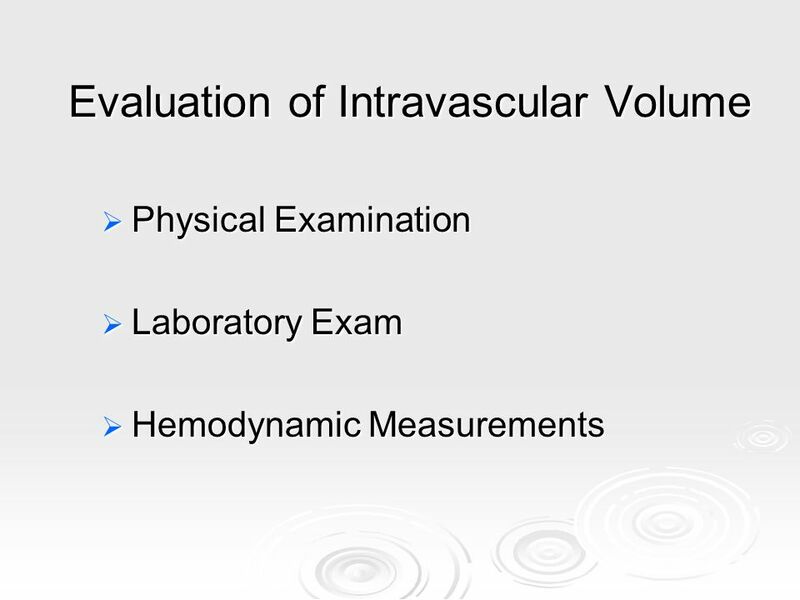 1 Fluid Assessment Cherelle Fitzclarence Overview Revision Cases. 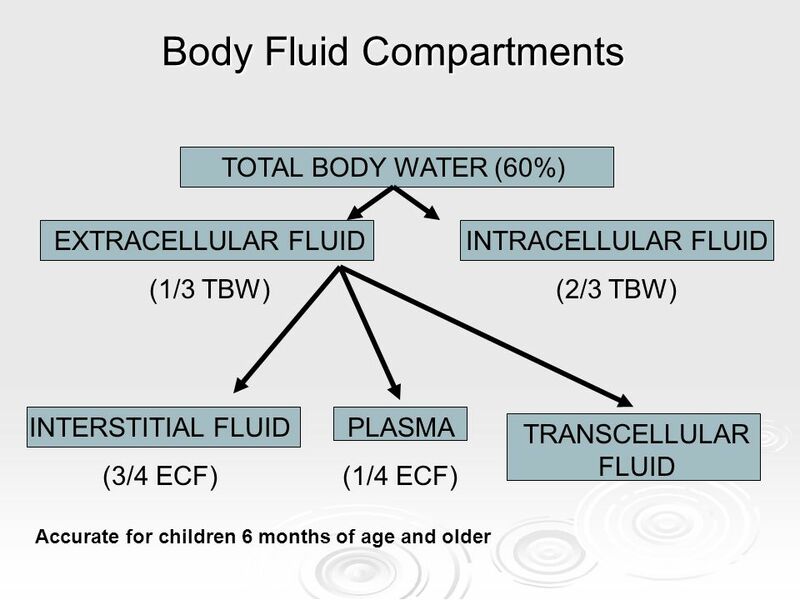 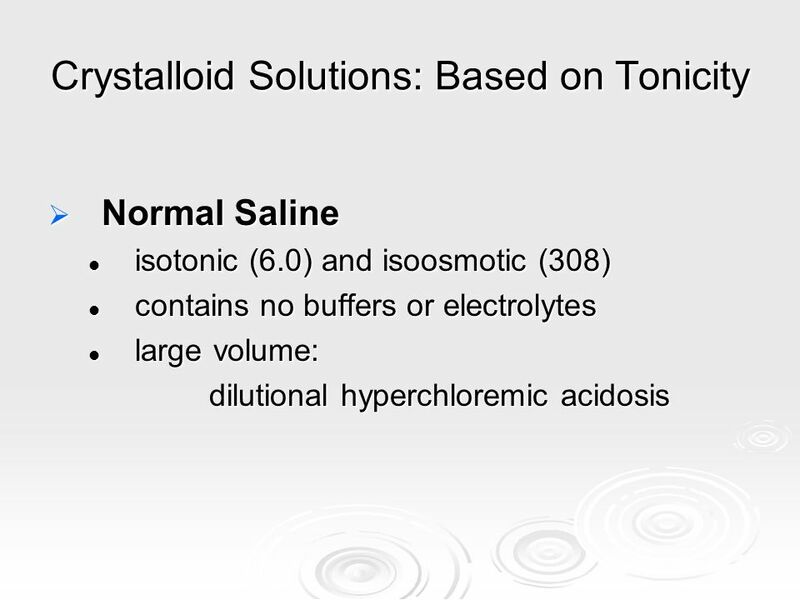 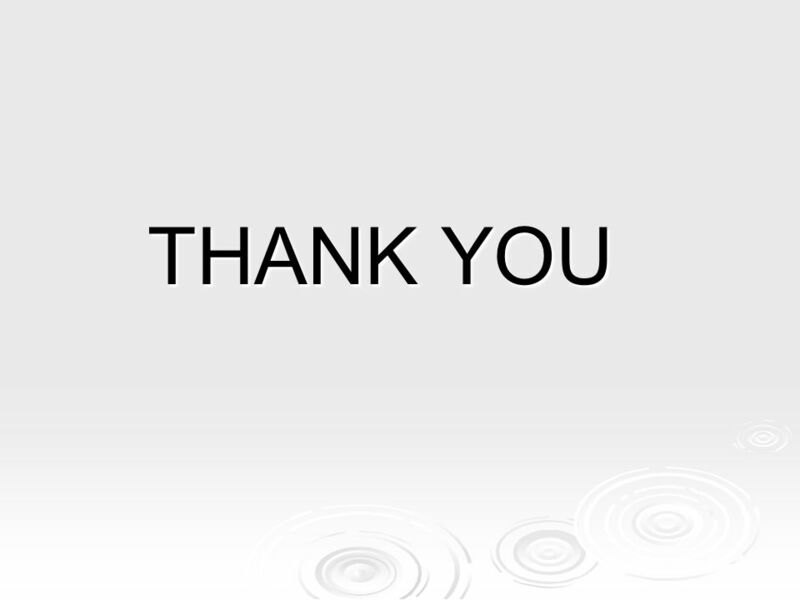 Fluids & Electrolytes Pediatric Emergency Medicine Boston Medical Center Boston University School of Medicine. 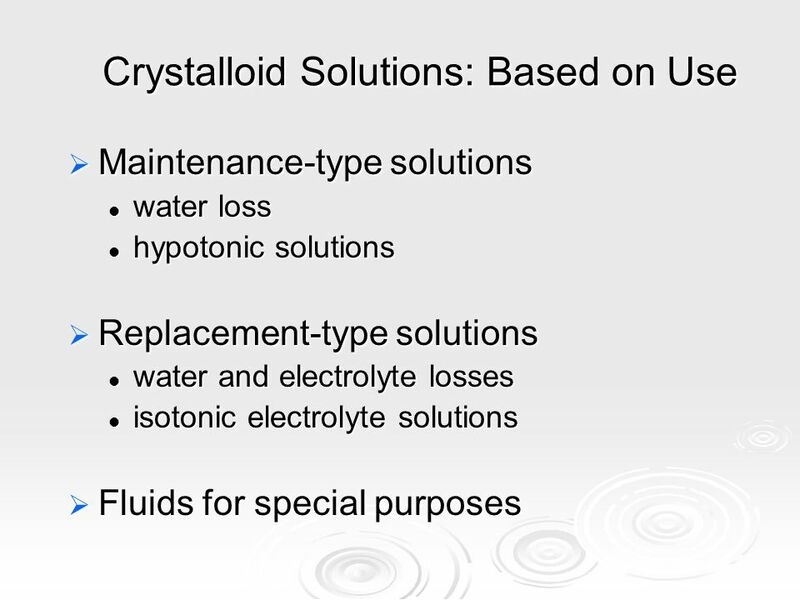 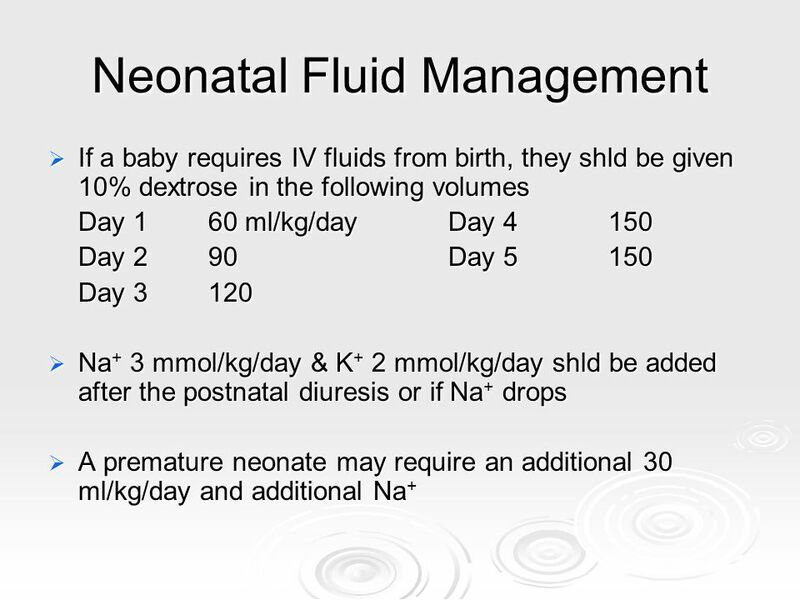 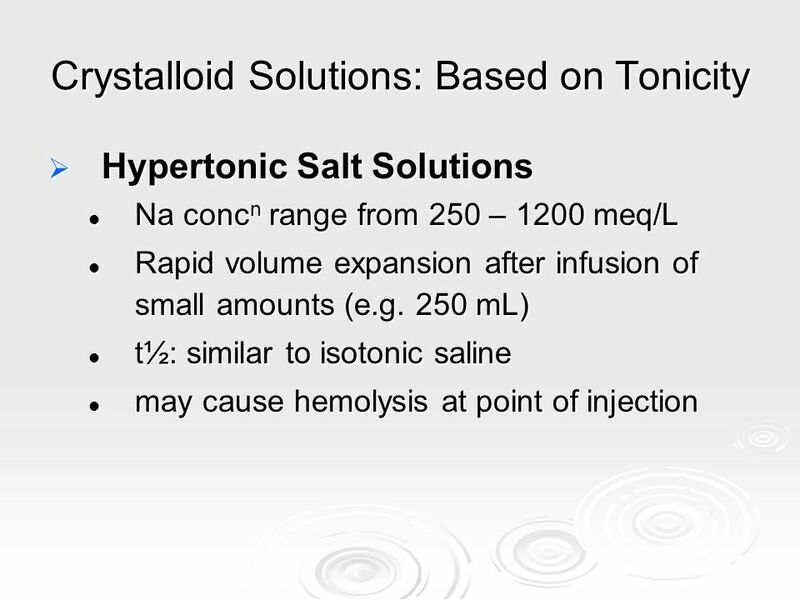 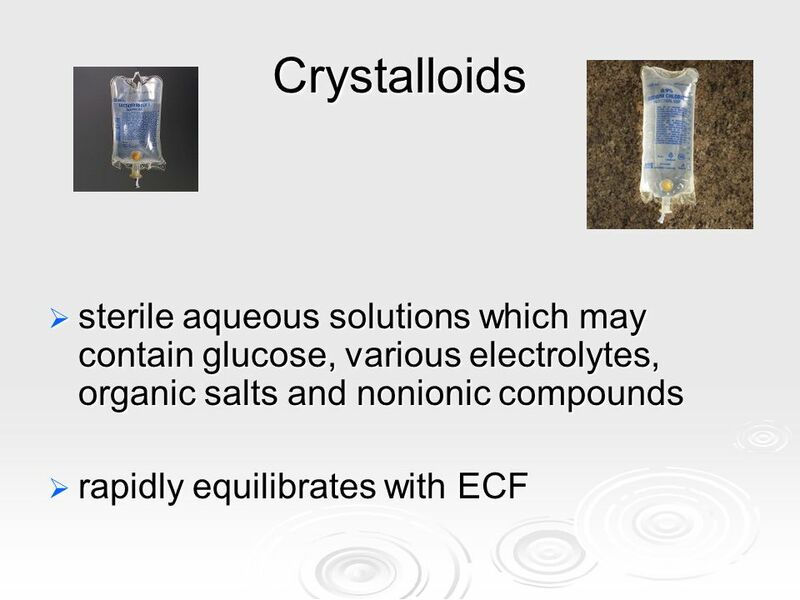 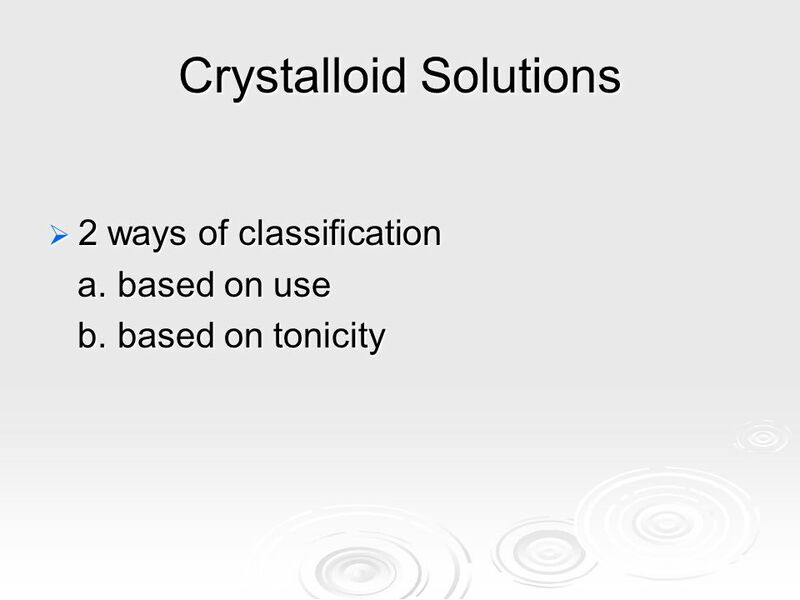 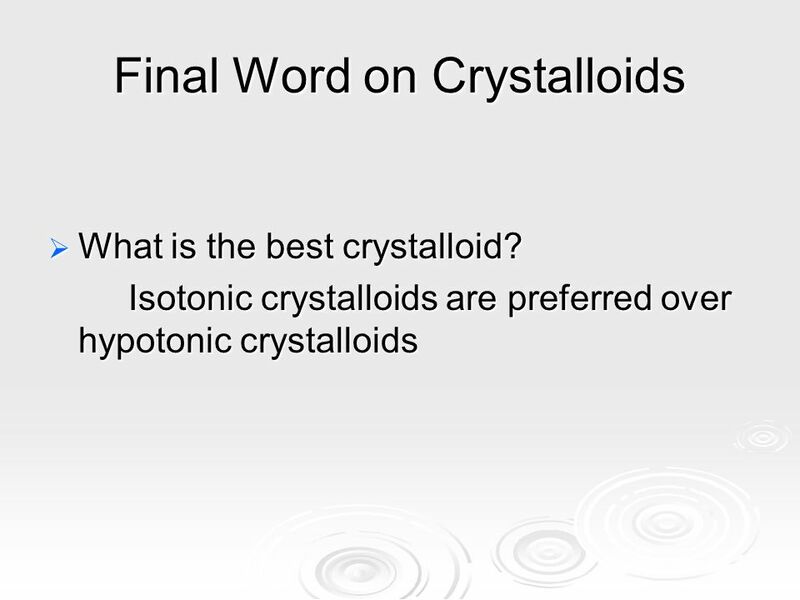 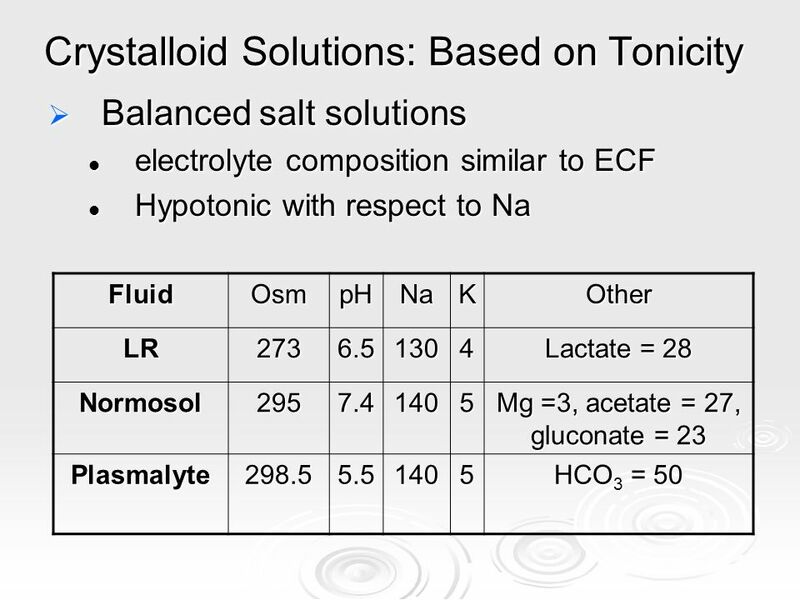 Fluids and Electrolytes in the Newborn Vandana Nayal.